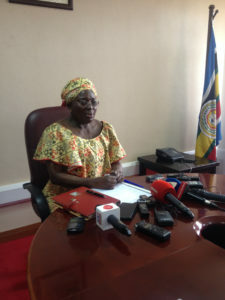 Speaker Kadaga addresses journalists at Parliament recently. File photo. The High Court has on Thursday issued fresh summons, ordering the Speaker of Parliament, Rebecca Kadaga and the Attorney General to defend themselves on accusations of abusing the law abusing the law when the former suspended some MPs from attending Parliament sessions. The legislators include Gerald Karuhanga, Ibrahim Nganda, Mubarak Munyagwa, Moses Kasibante and Allan Ssewanyana. The suspended MPs ran to High Court, challenging the suspension. The Speaker neither the Attorney General was presence in court on Thursday morning. They were, however, represented by Elisha Bafirawala, the lawyer from the Attorney General’s office. He asked for more time to prepare the defence, prompting court to postpone the hearing of the case. Oguli gave the accused up to January 3 2018, to defend themselves without fail or else the court will start to hear the case. Erias Lukwago, a lawyer representing the suspended MPs, told PML Daily that he needs Kadaga to appear in person for cross examination. “I want to cross examine. I want her to tell court where she gets powers to treat MPs like nursery kids,” he added. The suspended MPs said Kadaga acted as the law herself and her actions wouldn’t go legally unchallenged. The legislators also argue that the Speaker disregarded the provision of Article 28 and 42 of the Constitution by unlawfully mentioning their names. Last week, Lukwago told Oguli that they tried to serve the Speaker but they were blocked at the main entrance of Parliament. The security manning Parliament blocked MP Winfred Niwagaba, who is also the shadow attorney general, from serving summons to the Speaker.